This extraordinary structure, a short walk from Great Yarmouth's jolly sea front, with the terraces of bedsit land spreading to south and west, is the best example in Norfolk of an ecclesiastical village, the ultimate fruit of the Tractarian movement's desire for a return to the medieval monastic vision of the Church as a ritualist space, a place of teaching, of residency and of hospitality, all on one site. From the 1840s onwards this theory of architecture would be propounded, most notably by Pugin, but it would come to its ultimate expression at the end of the century, ironically with the non-conformists, who would built an agglomeration of church, school, hall and manse shoe-horned on to a single site in hundreds of places all over England. 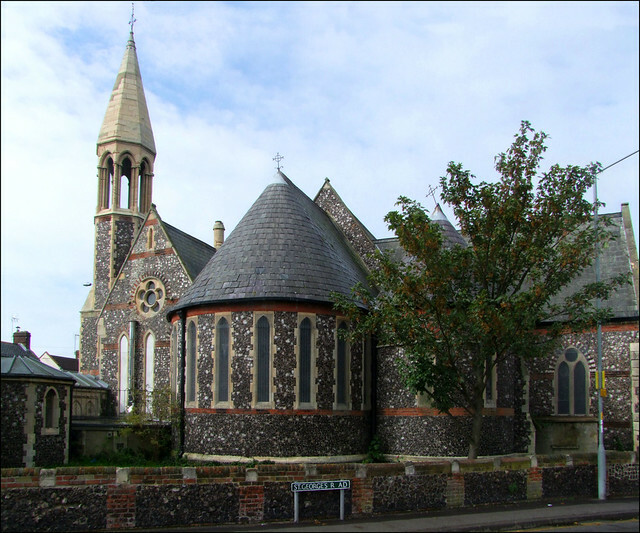 St John was, at heart, the 1850s work of JH Hakewill, whose less competent brother EC Hakewill is more familiar in East Anglia from his dozens of gloomy restorations. In this poor area it was intended as a church for fishermen and their families, perhaps the children of the fishermen that Dickens knew and brought to life in the pages of David Copperfield. This would have been the Peggoty family's parish. The church was then extended to west and north by a number of other minor architects in the subsequent decades. Best of all is Bottle & Olley's hexagonal vestry of the 1880s in the style of a chapter house, wedged into the most easterly point of the site. Bill Wilson, writing in the revised Pevsner, observes that this is a very odd, not very attractive group, but I am afraid that I think he is quite wrong. This huddle of oddly-shaped structures under their tower, turret and chimney, looking correctly as if they are a group of buildings which have accumulated over time for a variety of purposes, is exactly as it should be, and the Disneyland jauntiness of the whole is perfect for the seaside. I had wanted to see inside St John for a long time, and I was excited to note that it was on the participant list for the 2010 Historic Churches Bike Ride. It was something of a disappointment, therefore, to arrive at the church to discover that not only was St John not taking part, but that it had actually been declared redundant and abandoned several months previously. I am under the impression that some alternative use is planned by the joint parish of Great Yarmouth, and indeed this grouping could be a fabulous resource for them . I will keep an eye on developments. A part of me is rather glad that there is a recession on, otherwise one can imagine the rapacious property developers rubbing their hands at the prospect of turning this into apartments. Mind you, if they did, I wouldn't mind living in that chapter house.